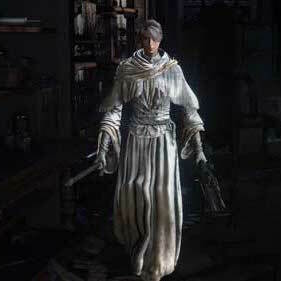 Iosefka is a non-player character in Bloodborne and owner of Iosefka's Clinic where the player begins their journey. There are, in fact, two Iosefkas: The real one and an imposter. The real one is the one you first meet through the door. She is kind, compassionate and gentle. When the player attacks her door repeatedly she kindly pleads, "Please stop, you are not a beast." If the player manages to access the clinic later in the game through the forbidden woods, a blue alien creature drops Iosefka's blood vial; that is the real Iosefka, but she was changed/experimented on by the impostor. She as the blue alien will take a while to become agro on the hunter. Impostor Iosefka is much harsher in the way she speaks and laughs maniacally when she asks the hunter to bring people in. Later in the game if you attack the door, she starts spouting mean words to the player and refuses to talk with you in the aftermath. 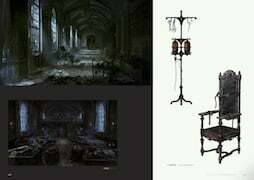 Prior to discovering the Cathedral Ward, Iosefka will repeatedly provide the player with a Iosefka's Blood Vial consumable if the player does not have one. After discovering the Cathedral Ward, "Iosefka" (who is actually the imposter) will encourage the player to send people to her clinic. Imposter Iosefka seems to experiment upon, and eventually transform or kill, any survivors sent to her. The number of "aliens" (Celestial Mob) in her clinic changes as survivors are sent. Aliens slain at her clinic will drop the corresponding loot from the NPC they were prior. She will reward the player with Numbing Mist (x2) or Lead Elixir for each NPC sent to her clinic, as well as 1 Insight. If the Suspicious Beggar is sent to her clinic, she will reward the player with 3 Blue Elixir and 2 insight. If the player causes her to become hostile and leaves, she will not be able to talk through the door again, even if the player sends more people to her clinic. If the player returns to the Hunter's Dream without making her hostile, she will close the doors and the player can speak with her at the top of the stairs again. She will tell the player that they are a "smart one" and beg them for more survivors. 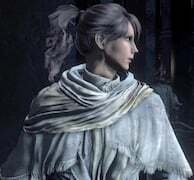 Her speech at this point alludes to the idea that she is a member of the Choir (who may have gone rogue during the fall of Yharnam since she appears to be doing this out of self-interest). When the player re-enters the clinic from the back during the Blood Moon phase and enters the room where she normally turns hostile, she will instead be found laying on a table on her knees, apparently with severe pain. At this point, she is not hostile and can be killed easily. Her dialogue implies that she is pregnant; killing her at this point will yield a very special item, One Third of Umbilical Cord. A Threaded Cane with Slow Poisoning. She usually throws a Numbing Mist at the start of the fight. She frequently makes use of Augur of Ebrietas. She will heal herself if her health reaches 50% and if the player stays far from her. She will use A Call Beyond if her health reaches 30% and if the player stays close to her; this can be staggered and prevented, or you may block it with a shield if you fail to dodge the projectiles. Iosefka is found behind a set of double doors, at the top of the steps behind the "1st Floor Sickroom" lantern. Only her voice is heard, but she can be seen through cracks in the doors by angling the camera. Attacking the door will cause her to become defensive, giving the player two warnings. If both warnings are ignored and the door is struck a third time, she will leave the doorway. Imposter Iosefka is found in the same exact location after you discover the Cathedral Ward with the original Iosefka gone (or more specifically, transformed into a Celestial Mob). During the night phase, she will relocate to her "safe room" located at the top of the stairs in a room accessible through the back entrance (you must travel from the Forbidden Woods to access this location). If you decide to not make her hostile and reload the area, she will appear once more in her original spot behind the double doors with said doors locked once more. Finally, during the Blood Moon, she will be found once again the "safe room." Are you... out on the hunt? Then I'm very sorry, but... I cannot open this door. I am Iosefka. The patients here in my clinic must not be exposed to infection. I know that you hunt for us, for our town, but I'm sorry. Please. This is all that I can do." (Gives 'Iosefka's Blood Vial' x1) "Now, go. And good hunting." Are you still in need of something? But I have nothing more to offer. Please, try to understand my position. I can only pray, for a fruitful hunt." You are safe, thank goodness. But I’m afraid nothing will change. I cannot open the door. I’ll do what I can, of course. Perhaps this will help you, if only in some small way. (Gives 'Iosefka's Blood Vial' x1). Now, go. I pray for your safety. This night is long, but morning always comes. Someone of your caliber won’t fail us, I am certain. And once the night of the hunt ends, we can speak face-to-face. Then I can finally see what you look like. I shouldn’t be thinking this but I am rather looking forward to it. So please, be careful out there. I'm sorry...I have nothing else to offer you. I will pray for your safety. May light shine upon this night, and your fortunes. [Talking to her again, but this time around not attacking the door once more] Are you calm again? Thank goodness. You mustn't let the hunt overcome you. Remember yourself. You are not a beast. Oh, well, hello....Splendid. Let me ask you a small kindness. You're soon off to hunt, I presume? Then, if you find any survivors, tell them to seek Iosefka's Clinic. Upon my Hippocratic oath, if they are yet human, I will look after them, perhaps even cure them. This sickness, these beasts, they are not to be feared. This time the night is long. I might be trapped here, but I should do something to help. I'll even offer a reward for your co-operation. Tempted? Well, off you go then. If you find anyone who’s still human, send them straight to Iosefka clinic. You can assure them, there’s no place safer. Please do me this service. Oh hello...You're all right. Very good. She's safe with me now, I presume you're to thank? The treatment is going well, stabilized, for the most part. Fascinating, really....Here you are, as promised. (Receive Numbing Mist x2 normally or Lead Elixir x2 if you sent the little Yharnam girl). There may yet be humans out there. If you find them, send them to Iosefka's Clinic. I endeavor to treat every survivor there is. So please, be a saint. Oh hello.....You're safe. What a relief. He's safe with me now. I'm thrilled to have another. Here you are, as promised. (Receive Numbing Mist x2). Ahh! Can't anyone comprehend?! That'll be quite enough of you then. Isn't it time someone put you out of your misery? The player only meets Iosefka once during the game, before entering the Cathedral Ward. The Iosefka you speak to after reaching Cathedral Ward is an impostor and a member of the Choir, the upper level of the Healing Church. The fake Iosefka, or "Fauxsefka," has taken up residence in the clinic in order to obtain subjects to experiment on. For experimentation purpose, old blood was taken from Ebrietas, Daughter of the Cosmos (or perhaps another kin being), and she will use it on herself, therefore elevating herself into a higher being, if the initial experiments proved to be successful. Tests were first performed on the real Iosefka and then anyone else the hunter sends to the clinic which result in their being transformed into Celestial Mobs, a type of kin (an elevated being that ranks above humans but below the Great Ones). Confronting her before killing Rom disrupts her plans and results in the hunter killing her. However, if the player comes after the Blood Moon appears, she will have succumbed to madness after imbibing a One Third of Umbilical Cord in a desperate attempt to evolve herself before the night ends. Ultimately it ends in failure as her blood remains red upon slaying her instead of the clear color of the the elevated kin. Iosefka's name can be traced back to the masculine Hebrew name Joseph ("God will provide"). Iosefka, or the Polish Józefka, is a diminutive form of the name Józefina. The true name of the Imposter Iosefka is never revealed. If you kill Imposter Iosefka and have not yet entered the Blood Moon phase, you can still send NPCs to Iosefka's Clinic. However, they still turn into "aliens" regardless. It could be a lack of insight on From Software's part, or it could mean the NPCs tried to use some of the blood vials there and unwittingly turned themselves into Celestial Mobs as a result. The player can navigate to the sickroom before the Cathedral Ward via the use of a bug and directly face the human Iosefka. The "impostor" theory is confirmed in the end credit. Jenny Funnell, the voice of the real Iosefka, had previously played both Yuria the Witch and Quelaana from Demon's Souls and Dark Souls, respectively. Players familiar with the Funnell's previous roles may note the jarring (if subtle) change in voice actresses after accessing the Cathedral Ward, subtly signifying that she has been replaced. Lucy Briggs-Owen, the voice of the imposter Iosefka, also voiced Adella The Nun, Vicar Amelia and young female protagonist (Youthful Voice); her voiced characters are primarily associated with the Healing Church. Iosefka wears a special variant of the White Church Dress, which has no boots. The Imposter Iosefka is barefoot, which is impossible for the player character while wearing the same item. So can you still able to talk to her after u keep smacking her door make her mad? And would she be back after I send more NPC to her clinic? does she loot seed if ure corrupted? So whatever happened to the real Iosefka? *You are filled with CONFUSION. When she says, "Oh, how exciting! I&apos;ve never worked on a hunter before," does that mean she is going to transform the Hunter into a Celestial Mob just like the NPCs? I mean, the Hunter is dead, so what would be the point? Fun fact: Impostor Iosefka&apos;s corpse makes the shape of the Hunter rune if she&apos;s killed on the table during the Blood Moon. In case anyone&apos;s having issues fighting Imposter!Iosefka, I actually just used a fairly good tactic that trivialized her nicely. First off, go into whatever quick melee your Trick Weapon does. don&apos;t bother with the slower power attacks (most weapons untransformed, some like the BoM can be tranformed). now when you round the corner to fight her, start attacking ceaselessly with R1, when your Stamina is low, hit [ ] for Beast Roar. it will knock her down and give your stamina time to regen. rinse, repeat, victory. weird suggestions, but the woman in the hut in forbidden woods, just before you find the tunnel that leads out at Iosefka is a character who goes sorely overlooked, and she is especially bizarre as she has a model but no related quest line. you cant send her to a safe area, and she says nothing of interest. my suggestion is she has something to do with Iosefka. what? I honestly dont know. first thought is that the impostor (due to looking identical to original Iosefka) somehow swapped through healing-church-great-one-weirdness, and this old woman is the original Iosefka, but as we basically know that OG Iosefka is the blue alien you always find, this blows the theory out of the water. in any case, that woman intrigues me. thoughts? Funny how this says she appeared to be in pain when she was impregnated by the great one, I felt the sounds she was making implied madness and arousal. I don&apos;t think the trigger for getting 2 insight and blue elixir from her is sending the Suspicious Beggar per se. In previous games I sent the Suspicious Beggar to her and only received the normal reward of 1 insight and numbing mist/lead elixir, but I had not yet entered the clinic from the Forbidden Woods. However, in my current game I entered the clinic from the Forbidden Woods and triggered her dialogue at the bottom of the stairs, left without aggroing her, and THEN encountered the Suspicious Beggar and sent him to her. When I returned to speak with her through the door, she gave me the "kinship" dialogue and the 2 insight & blue elixir. I suspect she gives this reward if you send her an NPC (including, but possibly not only, the Suspicious Beggar) AFTER you have entered the back of the clinic and "discovered" what she&apos;s really up to - your character is now sending her survivors without the pretense that she&apos;s going to help them. Hence the line "Cheers, to the discovery of kinship." I haven&apos;t tested this with other survivors as I&apos;d already sent them on their respective ways before killing Vicar Amelia... but if anyone can confirm that it works with any of the other survivors, I&apos;d love to know. "How they writhe, writhe inside my head..." This line isn&apos;t referring to tentacles or slugs like some people suggested, but Brain Fluid: "brain fluid writhed inside the head, the initial makings of internal eyes." Brain Fluid was used to create the patients of the Research Hall, which eventually became the Celestial Emissaries, delusional interpretations of the patients. Apparently, Brain Fluid was produced by simply imbibing water in copious amounts, but perhaps the Third Umbilical Cord produces a similar effect. Real Iosefka had a hard life. Whoops. Looks like I blew my chance at the umbilical cord. Killed the heck outta her, never met the pleasure woman. That&apos;s two of four possible umbilical cords, which you need three of to get the true ending. Ah, well. I can get into NG+ quicker I guess.